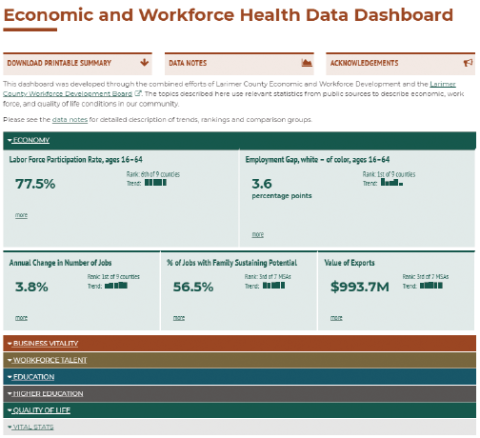 This dashboard was developed through the combined efforts of Larimer County Economic and Workforce Development and the Larimer County Workforce Development Board. The topics described here use relevant statistics from public sources to describe economic, work force, and quality of life conditions in our community. Please see the data notes for detailed description of trends, rankings and comparison groups. average, by age group, per week. Data sources and information on measures and methods are available for every item at the "more" link. Data represents what was the most recently available data in the 1st quarter of the current calendar year. All topics will be revisited and updated during the first quarter of the calendar year. Trends are presented as the most recent data points (typically annual, minimum of two, maximum of five). If it is not appropriate to use the data as a time series, no trend will be presented, even if multiple years of data are available. Rankings are always ordered such that the #1 ranked item is the more preferable value (lowest or highest, depending on metric). Items without ranking either lack comparable data from other locations, or it is not appropriate to rank the data (e.g. : no clear 'preferable' high/low value or the measure's methodology does not support ranking). Each item's detail page ("more" link) will include limitations on the data's use or design in the text. 9 County Peer Group: Larimer, Adams, Arapahoe, Boulder, Denver, Douglas, El Paso, Jefferson and Weld Counties. This group represents the Colorado counties with which Larimer exchanges its work force. Each county here has been consistently included in both the top 10 Colorado counties that are home to employees of Larimer-based employers and the top 10 Colorado counties where employers of Larimer residents are based since 2005 (U.S. Census Bureau, LEHD, OnTheMap). This criteria was selected because employers and communities in these counties compete for the same workers and residents that are valuable to our community and Larimer employers. Metropolitan Statistical Areas (MSAs) are geographical regions with high population density core and close economic ties throughout the area. These are Census defined areas that are used as units for analysis or statistical estimates. They are named for the more densely populated core. In Colorado, many of these MSAs align to county boundaries. For some data products, the MSA is the smallest geographic unit for which they are available. The Fort Collins MSA is sometimes called the Fort Collins-Loveland MSA and it shares its boundaries with Larimer County. The U.S. Census data tracks people moving between states specifically for a job change. These states are generally among the top states each year both for a Coloradoan to move to for a job and for someone to move to Colorado for a job (U.S. Census, Job-to-Job Flows Explorer). This indicates that employers in these states compete for or trade talent with Colorado. State level data is only used in this dashboard if data for a specific metric is only available at a state level. The Larimer County Workforce Development Board members for their vision, guidance and diligence in overseeing this project. The Larimer County Board of County Commissioners for supporting new and innovative approaches for delivering services. Larimer County Economic and Workforce Development and especially Amanda Repella for design, content, data aggregation, chart development and project implementation. Larimer County IT Web Service Team for their design input, technical assistance and implementation of the template for the dashboard interface. Many items and methodologies presented here were originally produced for the Greater MSP's Regional Indicator Dashboard. We are thankful to them for sharing their methodological documents. The COMPASS of Larimer County project (2001 – 2011) for creating the original web-based community indicators project for Larimer County.